Leeb, Olli : Bavarian Cooking . 10th ed. . n.d. . Sprache: Englisch. 171 p. w. numerous ill. and col. photoplates, 1 col. folding plate. . 21,5 cm . 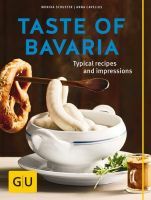 This book should, of course, say something about Bavaria, about the people and the customs, about the specialties served in restaurants and, above all, about Bavarian home cooking, to make it possible for you prepare at home what you liked here. This desire awakens mostly when holiday memories are rekondled. Since the simple ingedients of Bavarian cooking are available in every country of the temperate zone, it should certainly not be difficult to recreate your particular favorite dish. This is a collection of old family recipes, updated by the addition of new data for cooking times and temperatures. I hope you will have a good time cooking the Bavarian way, and wish you the best of success. 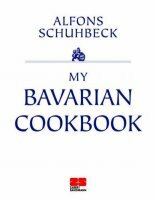 Schuhbeck, Alfons : My Bavarian Cookbook . 2007 . Sprache: Englisch. 200 S. mit über 70 farbigen Abbildungen . 25 cm . Alfons Schuhbeck is one of Germany’s most popular and best chefs. The Celebrity Chef and his culinary creations are synonymous with superb Bavarian cuisine. While remaining faithful to the classic dishes of his native land, he has continued to refine his culinary art with imagination und know-how. The result is a light, yet down-to-earth cuisine. Now the time has come to share this knowledge in a new, largs standard edition of ‚his‘ Bavarian cuisine. 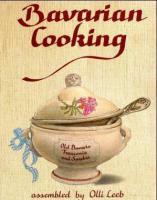 This cookbook delivers on its promise – his accumulated knowledge at a glance. Over 170 classic dishes and new recipes from Master Chef Alfons Schuhbeck: From satisfying ‚Brotzeitschmankerln‘ to sophisticated cold and warm entrees, from delicate fish to hearty meat dishes, finishing with delicious confections of pastries and desserts. Plachutta, Ewald ; Plachutta, Mario : Plachutta, englische Ausgabe . Classics of Viennese Cuisine . 2016 . Sprache: Englisch. 128 p. w. 50 col. figs. . 200 mm . One name stands for quintessential Viennese cuisine like no other: Plachutta. With more than one million sold books, with recipes simple to follow even for beginners, he brings the Viennese cuisine to people around the globe for years now. 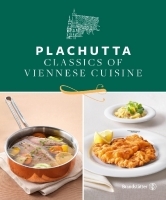 This book presents the most popular classics of Viennese cuisine, from apple strudel and goulash to Tafelspitz and Vanillekipferl. An exclusive special edition for all fans of this city and its food. 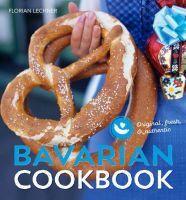 Lechner, Florian : Bavarian Cookbook . Original, fresh & authentic . Fotos: Raider, Peter . 2016 . Sprache: Englisch. 96 S. 45 farb. Abb. . 216 mm . Florian Lechner ist Pächter und Chefkoch des Landhotels Moarwirt mit Restaurant bei Dietramszell. Er steht für originelle, bayerische Küche, die Tradition mit Moderne verbindet. Fleisch und Käse bezieht er von den Herrmannsdorfer Landwerkstätten, einer überregional bekannten Bio-Metzgerei und -Käserei. Gault Millau lobt Florian Lechners unverkünstelte Interpretation von Klassikern der Alpenregion . Für seine sehr gute Küche, die mehr als das Alltägliche bietet, hat er 1 Haube erhalten. Schuster, Monika ; Cavelius, Anna : Taste of Bavaria . Typical Recipes and Impressions . GU Themenkochbuch Kochen international Kochen & Verwöhnen 2016 . Sprache: Englisch. 256 S. 250 Farbfotos . 247 mm . Mountains, lakes, cowbells, dirndl, chamois beard plus a jug of beer and some crunchy pretzels under a blue-and-white sky – it sounds like paradise and that is what it is, our Bavaria! As Bavarians love their food, and like to eat it in the open air, you will find here everything the heart desires in the beer garden, from sausage and radish salad to pork brawn. All the Bavarian favourites are here ordered by the occasions and places where Bavarians like to enjoy them. For example the Friday dishes – as that is when even the most meat-loving Bavarian will not put any meat into his or her plate: delicious steamed dumplings with crunchy crusts. And yes, many traditional events like the erection of the maypole, the driving down of the cattle from the mountain pastures, church fairs and folk festivals magically attract tourists. Why? Because there are so many delicious Bavarian foods to sample – visual and culinary delights. Hello then! The Original . . . 2016 . Sprache: Englisch. 304 S. 250 Farbabb. . 23,5 cm . 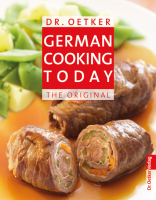 German Cooking Today, the recognized standard work that has had a fixed place in many households for generations, is now available in a new English edition after detailed revision. With many descriptive recipe photos, step-by step photographs and of course the precise, detailed instructions of these recipes, the book is exceptionally clear and user-friendly. In all, this will ensure that even the inexperienced cook will be certain of success in making the dishes. As well as many new recipes that arise from people’s ever-changing eating habits, you will of course still find such popular classics as Beef olives, Sauerbraten and Stuffed peppers in German Cooking Today. Seethaler, Susanne : Bayrisch süß . Sweet Bavarian Treats . Mit Weihnachtsbackteil. Includes Christmas Pastry. Deutsch-Englisch . Übersetzung: Byron, Susan . 1. Auflage . 2014 . Sprache: Englisch, Deutsch. 152 S. m. zahlr. farb. Abb. . 252 mm . 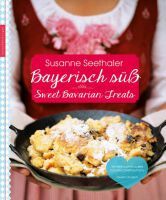 Juicy Plum Sheet Cake, crisp Bavarian Doughnuts, warm Curd Cheese Soufflé and creamy Danube River Waves are just a few of the sweet Bavarian specialties in this book as well as classics like Apple Strudel and Emperor’s Cutups. Whether for a rich main dish, refined dessert or simply as a tasty treat between meals – there are fine Bavarian sweets for any occasion, as well as for the Christmas season: Fragrant Baked Apples, Gingerbread and Little Rascals will seduce you to snack, bake and enjoy! Full of baking secrets and delightful stories from Bavarian kitchens. Dr. Oetker German Baking today . The Original . 2010 . Sprache: Englisch. 239 p. 270 Farbabb. . 230 mm . The standard baking book for every household – ideal for both beginners and experienced cooks. 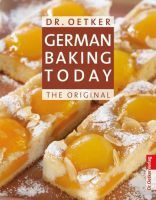 German Baking Today, the standard baking book for every household, is ideal for both beginners and experienced cooks. Having been extensively revised, this new edition now includes many new recipes and photographs, as well as the more classic cakes and pastries. In addition to popular, well-known recipes such as apple strudel, marble cake, Black Forest gâteau and Berliners, there are new recipes for muffins with chocolate chips, Maulwurftorte („mole cake“), buttermilk slices with cherries and Mohnstriezel. The detailed step-by-step photographs and extensive instructions for the recipes will enable even beginners to produce delicious cakes and pastries.